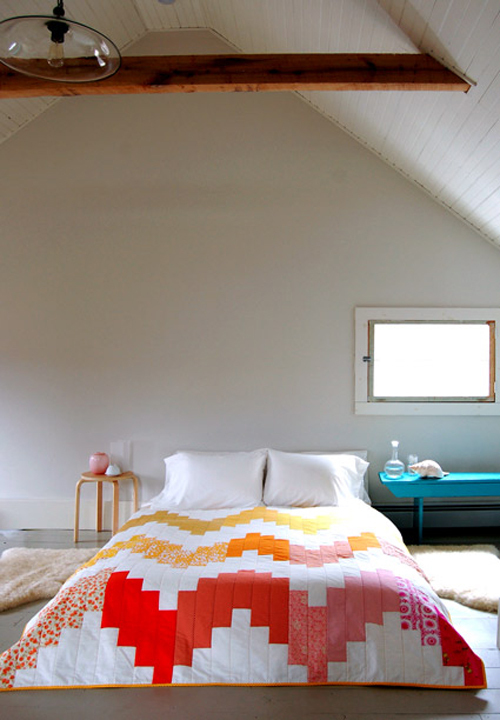 Today I’m loving … this beautiful quilt. You can find instructions on how to make this quilt yourself on the purl bee. While I have great admiration for the work involved in quilting, and often admire their beauty, I don’t usually have a “want one for myself” response. This has changed that. I want this! I love the modern design combined with the old fasioned craft! Beautiful!!! What a fantastic quilt! It is so modern and Bohemian at the same time. Gorgeous!!! I’m not normally a quilt person either but this one in the lofty room with the turquoise table is perfect. I’m loving this whole modern country look – Scandinavia meets California. Very inspiring! The colours are soooo great. And the front looks like hearts in a way. This is beautiful! My fiance and are lucky enough to have a quilt being custom made for us as a wedding present. I can’t wait to see it. Absolutely love it. You managed to fuse 2 styles together, country and modern. It’s like tetris, I love the colors!